Robin, happily reports that you can get free wifi connection at Life Coffee and Tea at the Powerstation, Macapagal Blvd. in his blog, Mobility Philippines. I'm happy to report they have good food and drinks, too. Life Coffee and Tea serves brewed coffee and hot or cold espresso and mocha based drinks (ranging from Php75-Php160). For those of you who prefer tea to coffee, you are going to love it here. You can order hot tea in a pot or choose from a selection of cold teas that also come in many different fruity flavors. Their Cold Teas (Php80 for small, Php90 for medium and Php100 for large) are perfect for the summer. 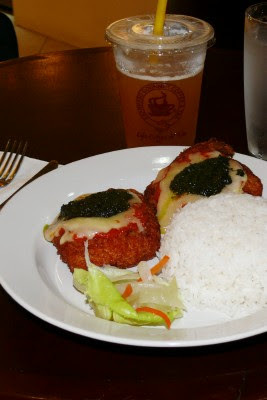 My personal favorite is the Iced Mango Green Tea, which I always order with the Chicken Parmigiana (Php165). Yes, they do serve main course meals here ranging from Php165 to Php175, and they are pretty good. Not what you'd normally expect from a cafe that primarily serves coffee and other beverages. Besides their main course meals, they also serve appetizers ranging from Php120-Php150. 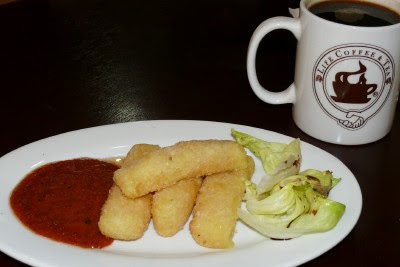 Our favorite is the Mozzarela Sticks (Php135). They also serve salads, pasta and panini.